17th January 1872: On His departure from Sri Bhaini Sahib, bidding farewell to his countrymen. Satguru Ram Singh Ji is seen in a bullock cart having covered himself with Mata Karmo’s black blanket and consoling his perturbed sangat. Nothing is in comparison to ‘Naam’. Meditating on it is the ONLY prime duty of a Sikh. Satguru Uday Singh Ji UK dhora in May 2018. Sri Satguru Uday Singh Ji graced the Sadh Sangat of UK from 17th to 20th May 2018. It was an unexpected ‘mini dhora‘. 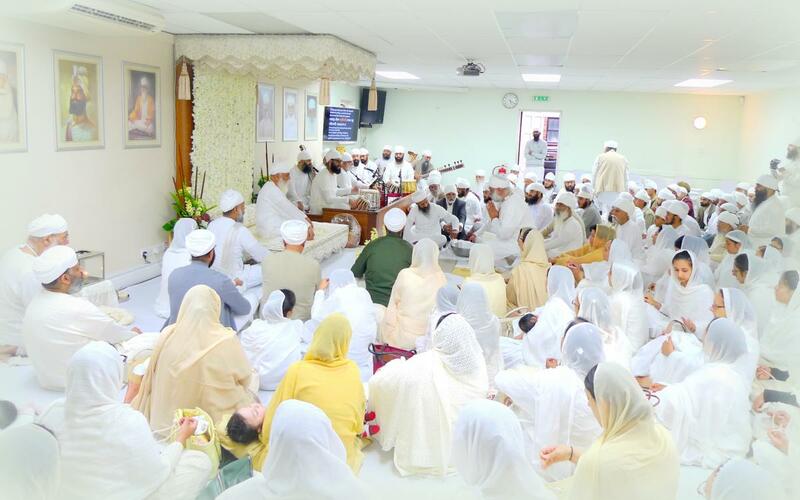 The Sadh Sangat had His pious darshan and blessing during gatherings in West London, Leicester and East London. The first two Asa De Vaars and one evening dewaan were hosted by Namdhari Sikh Sangat Southall. The dhora contingent then went on to Birmingham, Leicester and East London. 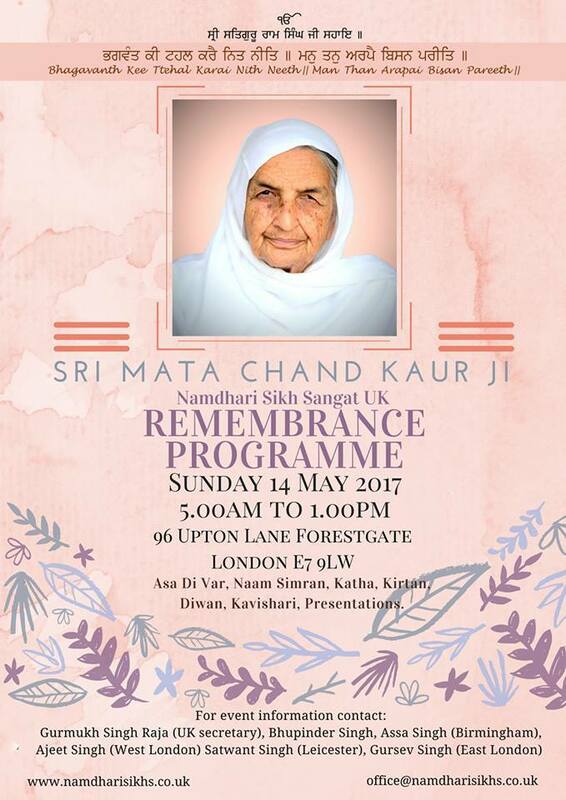 In London the program of 19th May was dedicated in memory of Sri Bebe Dalip Kaur Ji and on 20th May, the sadh sangat remembered the late Prof Tara Singh Anjan Ji. The closing solaks of Sri Adi Guru Granth Sahib were read to conclude a paath in memory of Mata Kirpal Kaur Bhamra (w/o Sant Joginder Singh Bhamra) who sadly passed away on 6th May 2018. Mata Kirpal Kaur and family has done selfless seva during Sri Satguru Partap Singh Ji’s visits to East Africa and Sri Satguru Jagjit Singh ji’s dhoras to Kenya & UK. She was a devout member of the Southall Sadh Sangat. Shardaanjali (tribute) were said by Southall General Secretary Ajeet Singh. Earlier the raagis recited the bani of Guru Teg Bahadur – shabad ਪ੍ਰਾਨੀ ਕਉ ਹਰਿ ਜਸੁ ਮਨਿ ਨਹੀ ਆਵੈ ॥ (Praanee Ko Har Jas Man Nehee Aavai) and the Bhagat Ravidas shabad ਜੋ ਦਿਨ ਆਵਹਿ ਸੋ ਦਿਨ ਜਾਹੀ ॥ (Jo Dhin Aavehi So Dhin Jaahee). Sant Professor Tara Singh Anjan ji has left for his heavenly abode on 06 March 2018… the Namdhari community has lost a gem… Tara Singh Anjan ji was a par excellence Namdhari historian, researcher, author of several books and speaker. We share a collection of Short Lectures he delivered during his stays in Southall UK. The August 2017 dhora (visit) of Sri Satguru Uday Singh Jis to the UK began today. Namdhari Sangat Southall held the first 3 events of the 5-day visit. This morning a large gathering of sadh sangat took place at SKLPC hall for the reverent darshan of Satguru Ji. Asa de Vaar was recited by hazuri raagis Balwant Singh and Harpreet Singh along with a contingent of the UK based raagi jatha. The shabad ਇਕ ਅਰਦਾਸਿ ਭਾਟ ਕੀਰਤਿ ਕੀ ਗੁਰ ਰਾਮਦਾਸ ਰਾਖਹੁ ਸਰਣਾਈ ॥ (Eik Aradhaas Bhaatt Keerath Kee Gur Raamadhaas Raakhahu Saranaaee) was sung in praise of Sri Guru Ram Das ji (24 Aug marked the joti Jot diwas of fourth Guru). The evening session was made up of Naam Simran, kirtan and kavishri. Theteam of East London youngsters, Jassa Singh, Surinder Singh, Santa Singh and Gursev Singh presented apoetic composition narrating supreme sacrifice and martyrdom of Bhai Taru Singh Ji. Later Sri Satguru Uday Singh Ji officially endorsed the launch of a SET OF 4 DVDS. 3 were Namdhari Nitnem comprising 18 banis and the 4th was Adi Guru Granth Sahib introduction which includes techniques for recital of bani. All are on YouTube. (Search for ‘Namdhari Nitnem’ for the banis and & AGGS00 for introduction). This compilation has been put together by Sant Kirpal Singh Chana in collaboration with Master Dharsan Singh (Sri Bhaini Sahib). The set was formally presented to Satguru Ji, by his grandson Taran Singh. This mornings Asa de Vaar was the last event of the West London leg of the Dhora. Asa de Vaar was recited by the UK based raagi jatha. This evening, Jagjit Arts was officially launched in Sri Satguru Uday Singh Jis Hazoori at the concert, The Rainmaker, held at 8:00 pm at Kings Place, London. The concert had a stellar line up of world-renowned artists including Sri Satguru jis Hazoori Ragis, performing rare North Indian classical music compositions and culminating with an East-West ensemble led by Talvin Singh and Taufiq Qureshi. Jagjit Arts was founded to take Sri Satguru Jagjit Singh Ji’s vision forward, which was to maintain our rich musical heritage by presenting excellent events for all. The Dhora now moves to East London, Leicester, Leeds and Birmingham. Southall Visit: Sri Satguru Uday Singh Ji blessed the UK sadh sangat during a short 3 day visit. (Friday, June 2 to Sunday, June 4, 2017). This visit to the UK included his first visit to Namdhari Sikh Sangat Southall (NSSS), since attaining Gurgaddi in 2012. NSSS hosted the first Asa de Var of the dhora on 2nd June. The rest of the events took place at Namdhari Gurdwara, East London. It has been 17 long years since the last visit to the Southall premises by Sri Satguru Jagjit Singh Ji. The desire and passion for this long waited blessing was clearly reflected by attendance and mood of the gathered sangat. – as Guru Nanak says “Were a hundred moons to rise and a thousand suns, the light so created will be but utter darkness without the Guru” . The Asa Di Var kirtan was recited in the early morning hours in a very melodious way and style. Ustad Harbhajan Singh and raagi Kirpal Singh took lead and it was sung collectively by UK based musicians. The Asa di Var was interlaced with soul searching Hymns (shabads). Before the conclusion of the program Sri Satguru Uday Singh Ji delivered his pavitaar updesh to the sangat. 1 February 2017 is Basant Panchmi and the Parkash Utsav of SRI SATGURU RAM SINGH JI. (Born on Basant Panchmi of 1816). Sri Satguru Ram Singh ji is ranked as one of the personalities who shaped the millennium. Sri Guru Ram Singh considered political freedom a part of religion. He had lasting influence which changed the history and outcome of British rule in India. Satguru Ji's wisdom and philosophical outlook contributes to mankind and had influence on its contemporaries. His contribution for gender equality on its own, takes him to the top of the list of supreme reformers of the world. Sri Satguru Ram Singh Ji preached for goodness of whole mankind. Such was his charisma, that during his fight for India's independence, it rekindled Sikhism in thousands of Sikhs who became to be known as 'Namdharis' or 'Kookas'. Dhan Sri Satguru Ram Singh Ji ..
Sri Satguru Ram Singh Ji was in the line of great spiritual leaders of the world, but he had vivified his spiritualism with action and sacrifice. After the downfall of the Sikh Government, when utter demoralization had set in among the Sikhs, Sri Satguru Ram Singh Ji re-kindled into them the spirit of Guru Nanak and Guru Gobind Singh and chalked out a programme of action to train them in the mission which the Gurus had come to fulfil. Sitar Recital.....Sitarist Jasdeep Singh Degun with Harkiret Singh Bahra on tabla. KukaSikhs.com is an invaluable source of information for members of the community and others alike. It includes details of its weekly programs, activities, melas & festivals, publications and connections to Namdhari Sangat's world-wide network. We hope it is an invaluable source of details of the Namdhari Sikh religion, its history and rich culture. This web site has been designed with the members of the entire sangat in mind - the designers have a vision of a site for the sangat by the sangat. With blessings of Sri Satguru Jagjit Singh Ji, the site was launched on 1st September 2002.